I’ve been thinking about new cookie recipes and I’ve also been wanting to work with anise seeds. 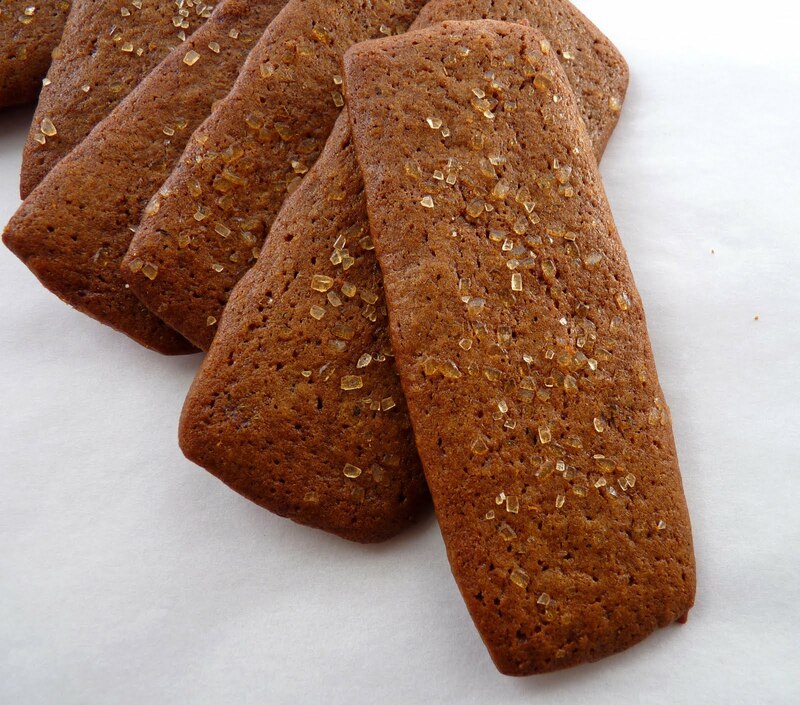 If you’ve had Italian cookies or classic biscotti or the biscochitos of New Mexico or Spanish mantecados, you know how really delicious just a hint of anise can be. These little cookies are so ultra light you’ll hardly know you’ve eaten one. The flavors are very subtle, the texture crispy and delicious. 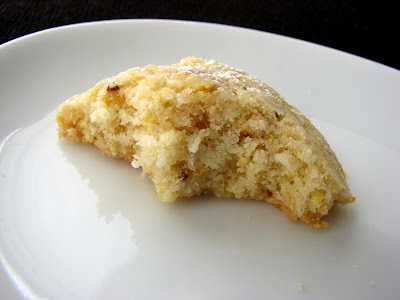 I’ve added semolina for a nice crumb and the orange zest really brightens the taste. If you’re looking for a unique cookie to add to your file, try these little clouds. I'm betting they go well with champagne. A note of special thanks and appreciation to all the readers and supporters of this blog. I'm very grateful for your gracious company. Here’s wishing everyone a very Happy New Year full of friends, family, new opportunities and the sharing of many delicious morsels! 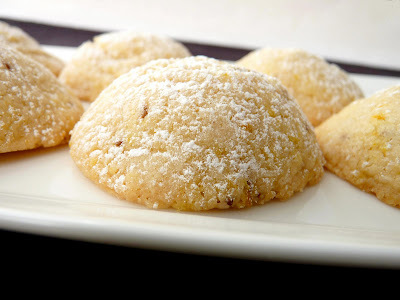 - The baked cookies are lightly dusted with confectioner’s sugar rather than rolled and coated. - These cookies are best stored in an airtight container if they last that long! - Bouchon, little chocolate cakes baked in the shape of a champagne cork, make an especially fun New Year's Eve treat. Place the flour, semolina, sugar, salt, anise seeds and orange zest in the bowl of a food processor. Blend for a few minutes until the orange zest and some of the seeds are finely chopped. Add the butter and vanilla and process until a soft dough begins to form. Pour the dough out onto a work surface and knead if necessary to fully blend. Scoop or shape the dough into 24 balls about 1 1/4” in diameter and place on a small baking sheet. Wrap and refrigerate until thoroughly chilled. Bake on the center rack of the oven for about 22-24 minutes, rotating the pan halfway through. The bottoms should be golden but the tops should not take on any color. Cool completely. Using a sifter, lightly dust the tops of the cookies with confectioner’s sugar. Toward the end of every year festive cakes abound. They tend to have dried fruit and/or nuts and/or lots of booze. This is one such cake. It’s not an everyday cake but one that you’d want on a platter with all your other holiday treats. In fact, if you still have some holiday eggnog lying around, it would probably make a good pairing. 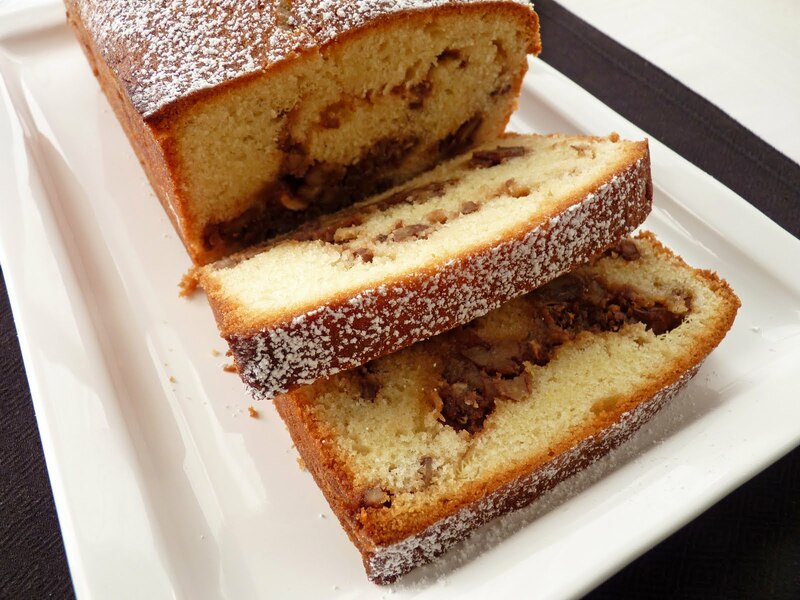 This has a brown sugar caramel pecan mixture layered into a very simple cake with the wonderful holiday flavors of rum and nutmeg and a snowy dusting of confectioner's sugar. Not very complicated and not very fussy. Just a bit festive and fun! My very best wishes for a Happy Holiday Season to you and your loved ones. Cheers!! - Toast the pecans in a 350 degree oven for about 5 - 10 minutes or until they are only slightly darkened and give off a toasty aroma. Check them frequently and give them a shake to avoid having them get too dark and taking on a bitter taste. - Dollop the thick and gooey pecan caramel mixture but no need to try and spread it into an even layer. I used a tablespoon and there were about 6 - 7 dollops in each layer. Just be sure to keep it from touching the sides of the pan where it is likely to burn and taste bitter. 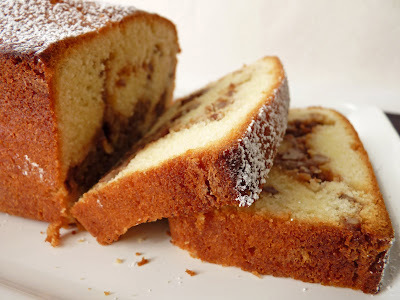 - For storage, wrap the cake tightly in plastic wrap to ensure that it stays moist. 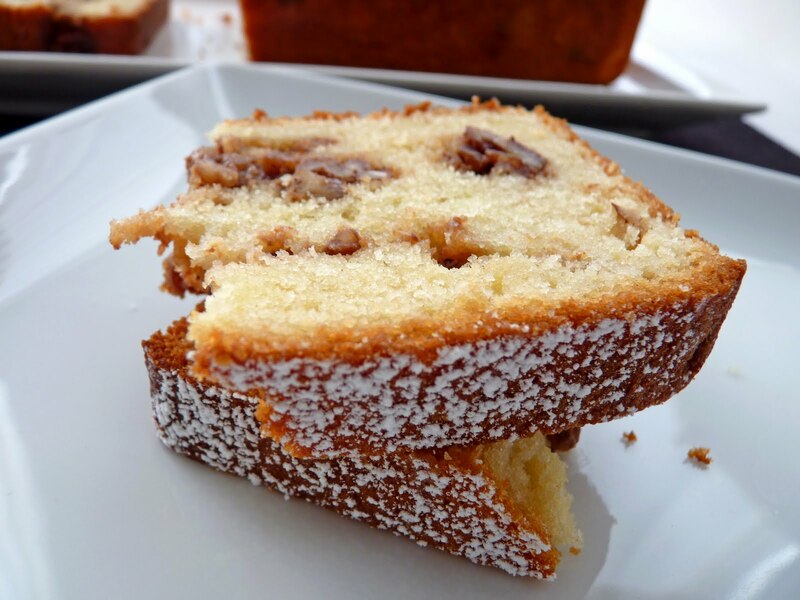 - If you prefer brandy and walnuts, try the very delicious Walnut Brandy Cake. For the pecan filling, place the cream, espresso powder and cinnamon in a saucepan over very low heat. Stir to dissolve. Add the brown sugar and whisk until thoroughly combined. Increase the heat and boil for two minutes. Take off the heat and add vanilla, rum and salt, to taste. Stir in the chopped pecans. Set aside to firm up. Prepare an 8 1/2" x 4 1/2” loaf pan with a light application of butter or oil and a piece of parchment paper large enough to form an overhang on both sides along the length of the pan. Lightly grease the parchment. Combine milk, rum and vanilla. Cream butter and gradually beat in sugar. Scrape down the sides of the bowl and beat until light and fluffy, about 3 to 4 minutes. Add eggs one at a time, making sure that each one is incorporated before adding the next and scraping down the bowl as necessary. Alternate adding a third of the flour to the butter and eggs with 1/2 of the milk mixture, beginning and ending with the flour. Once all the ingredients are in, mix just a minute or so then finish the mixing gently by hand. Pour one third of the batter into the prepared loaf pan. Use a small offset spatula or spoon to spread the batter evenly. Gently dollop half of the pecan mixture on top of the batter, making sure it does not touch the sides of the pan. Layer another third of the batter on top of the pecans and gently spread that out. Dollop the remaining pecan mixture. Finish with the remaining batter and spread gently. Bake the cake for about 50 – 60 minutes or until it tests done. To store, wrap tightly in plastic wrap. Cookie season is in high gear. Chocolate, vanilla, nuts. Crunchy, chewy, crispy. Plain and adorned. Sliced, rolled, dropped and scooped. Sandwiched and thumbprinted, dipped and dusted. As the flour flies and the mixer whirs happily, oh what fun to share so much abundance. 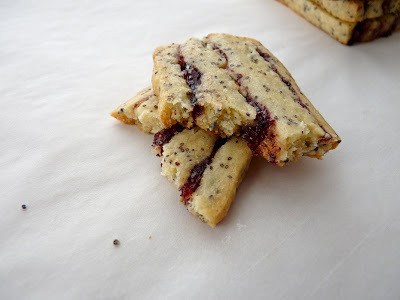 These cookies are a little riff on Nancy Baggett’s Cranberry-Cherry Icebox Ribbons. I threw some poppy seeds into the cookie dough and used mixed berry preserves in the filling to produce these striped and polka dot gems. Cookies are always a welcome ritual in this season. I hope your holiday baking fills your kitchen with wonderful aromas, family and friends. - The filling can be made and stored in the refrigerator for up to 4 days. - The dough is frozen so the cookies are easy to slice and hold their shape. - Frozen cookie dough will keep for up to 1 month. Transfer to an airtight container. - One test for doneness for cookies is to gently nudge one with your fingertip. If the cookie slides easily, they are done. If you feel a lot of resistance, bake for another minute or so. Once removed from the oven, most cookies will need to firm up for a minute or two before moving to a wire rack to cool completely. 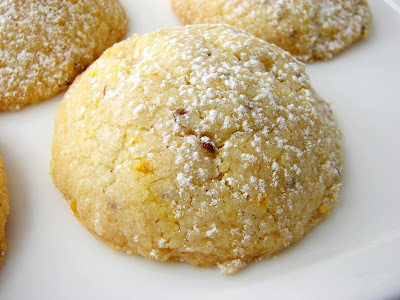 - Lots more cookies in my Recipe Index. For the filling, combine the dried cranberries, berry preserves, sugar and orange juice in the bowl of a food processor. Process until coarsely pureed. Transfer the mixture to a saucepan and cook over medium heat until the mixture comes to a boil. Stir to prevent scorching. Remove from heat and add the vanilla. Cover and refrigerate until chilled and thickened. For the cookie dough, sift the flour, baking powder and salt. 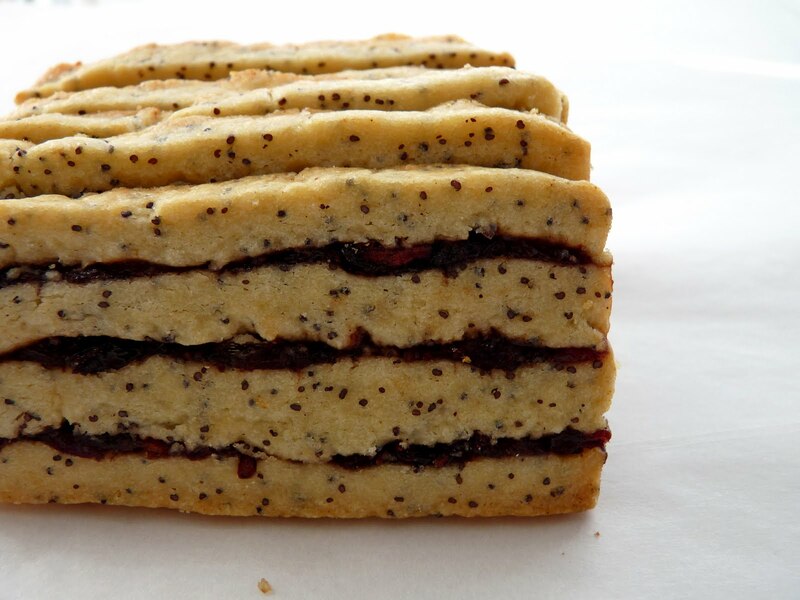 Whisk in the poppy seeds. Add the egg and vanilla and mix thoroughly. Add the flour mixture and beat just until incorporated. Let the dough rest for about 10 minutes. If it's too soft to handle, chill it for about an hour or until it's easy to work with. Line a 4 1/2” x 8 1/2” loaf pan with plastic wrap, leaving an overhang of about 4” on each side. Divide the dough into quarters. Shape one portion into roughly the size of the loaf pan. Place in the pan and pat an even and smooth layer into the bottom. Spread one-third of the cranberry filling over the dough with a small spatula. Repeat with the remaining three portions of dough and two portions of filling. Fold the plastic wrap over the dough, completely sealing it. Freeze the dough in the pan until very firm. If the dough is too soft, the filling will squish out when the dough is sliced. Preheat the oven to 350 degrees. Line baking sheets with parchment or a silpat. Remove the cookie dough from the freezer and carefully unwrap. Use a sharp knife to trim the sides into straight angles. Clean the knife between cuts. Cut the loaf into thirds crosswise, forming three blocks approximately 2 3/4” x 4”. Work on one block at a time, keeping the others chilled. Cut each block into 1/4” slices that are about 2 3/4” long, keeping your knife clean after each slice. Place the slices on a baking sheet about 2 inches apart. Bake one sheet at a time for about 12 - 14 minutes, until the edges start to darken and firm up. Cool the cookies on wire racks. I’m one of those people that likes the idea of eggnog, but can never really manage to taste more than a sip or two because it’s so incredibly rich. But since I like the flavors quite a bit I decided to make an ice cream that showcases the same ingredients but cuts back on some of the eggs and cream while still maintaining the desired creaminess and luxury of eggnog. Profiteroles are such a delicious way to enjoy ice cream, so this is my preferred vehicle to enhance this presentation. 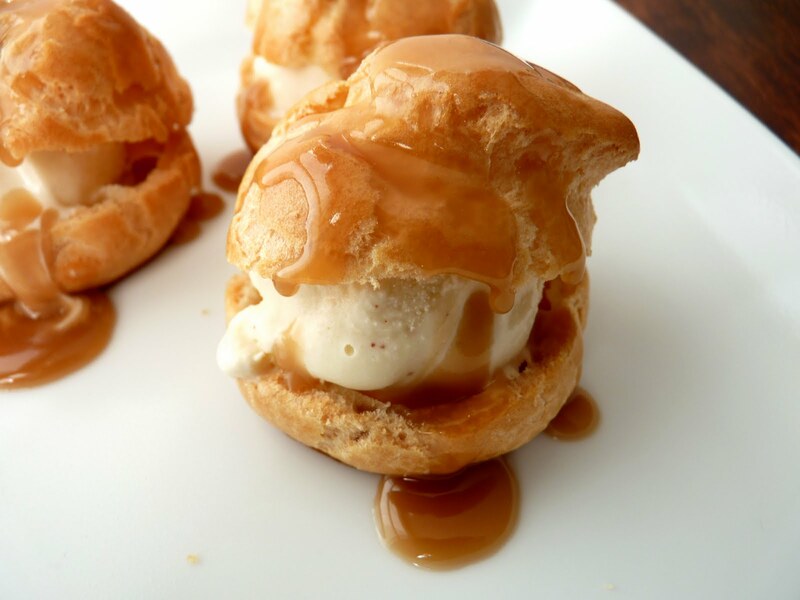 A great pâte à choux adds texture and balances the richness of the ice cream. The Rum Sauce is made with brown sugar, butter, a little cream and a dash of rum and brings a level of delicious festivity that is completely irresistible. Pâte à choux is a wondrous pastry. 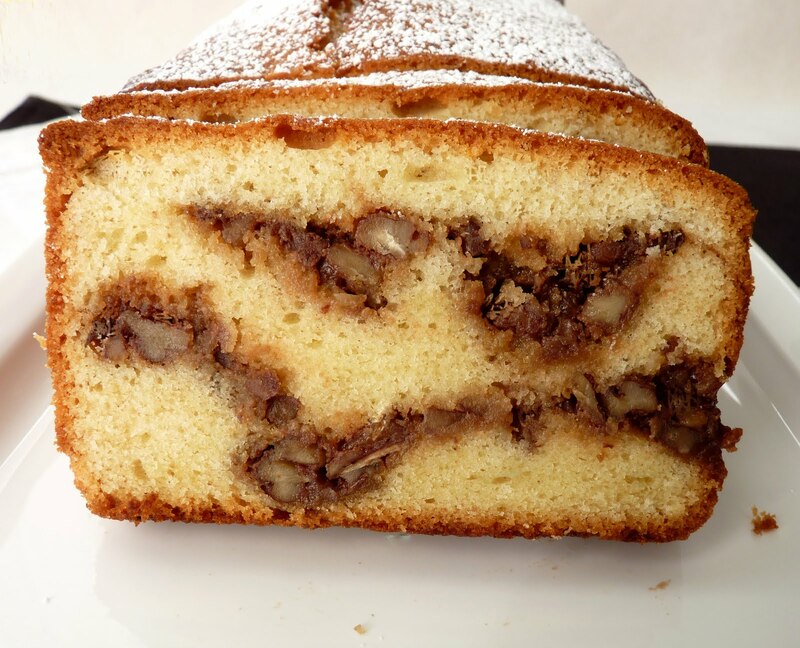 Legend has it that a chef by the name of Panterelli invented it in 1540, years after accompanying Catherine de' Medici and her court from Florence to France for her marriage to King Henry II. In the nineteenth century, Antoine Carême, who was the very first celebrity chef and responsible for the emergence of haute cuisine, perfected the recipe that is most commonly used today. If you’re looking for a fun and delicious idea for a holiday dessert over the next few weeks, I highly recommend this truly luscious combination. I think you’ll find it will bring a collective sigh of pure enjoyment from just about everyone at your table. 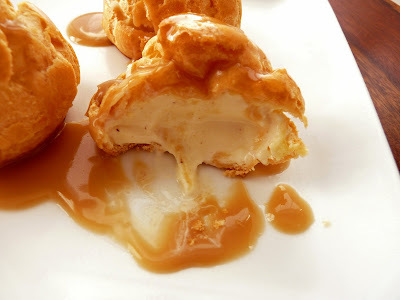 In fact, you may want to double the profiterole recipe for a repeat performance in case you receive a standing ovation. Cheers! 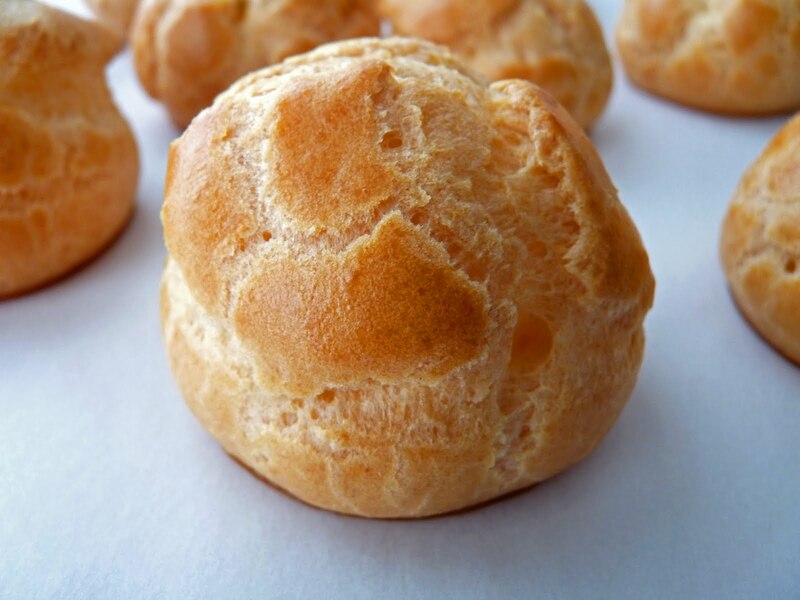 - Pâte à choux is a classic light pastry that forms the base for éclair, croquembouche and cream puffs. It’s not difficult to make. It just requires that you try not to hurry the process. What makes it all work are a few simple techniques. 1) Once you add the flour to the water and butter, make sure you stir and cook the dough for a couple of minutes so there is a steam rising and a film appears on the bottom of the pan. This cooks out the taste of the flour. 2) Take the dough off the heat and beat it in a mixer or with a wooden spoon until there is no longer any steam rising. This helps to dry out the dough in preparation for incorporating the eggs. 3) Add the eggs 1 at a time and mix thoroughly before adding the next. The dough will look lumpy at first but will smooth out beautifully. Scrape down the bowl after each addition. 4) The pâte à choux is ready when it is smooth and shiny and falls from a spoon in gloppy sheets. 5) Always use an egg wash to ensure even, pretty browning. 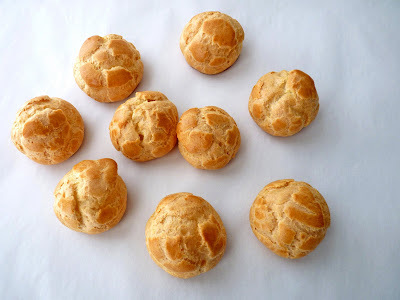 6) The test for baked pâte à choux is when a piece feels very light and sounds hollow when tapped. - If you don’t have a stand mixer, you can easily use a wooden spoon to beat the mixture. - I love the experience of opening the oven door and finding this lovely soft piped dough transformed into all these beautiful billowy pastries that are so light and gorgeous. The term choux means cabbage in French, so these little gems are meant to look like rustic visions of cabbage. In some cultures the dough is fried, such as beignets and churros. - I use a serrated knife to slice the profiteroles. - The principal spice in the ice cream is nutmeg. I add just a small dash of cinnamon and a smaller pinch of cloves to warm it up and echo the spiciness of eggnog. - The ice cream and the sauce can be made ahead of time. I prefer fresh profiteroles eaten the same day but you can freeze the baked profiteroles in an airtight container. Thaw, cut in half and crisp in a 350 degree oven for about 5 – 10 minutes. Bring milk to a simmer over moderate heat. Whisk the yolks and sugar together in a bowl until thickened and light yellow. Gradually add the hot milk, whisking constantly. Pour the mixture back into the pan and cook the custard over moderate heat, stirring constantly, until it coats the back of a wooden spoon. Be very careful not to let the mixture heat too quickly or boil. Immediately pour the custard through a fine-mesh sieve into a clean container and stir in the cream, rum, vanilla and the spices. Whisk thoroughly. Add salt to taste. Cover and refrigerate until chilled thoroughly. Freeze in an ice cream maker. Transfer to an airtight container and place a piece of plastic wrap on the surface. Cover and put in the freezer to firm up. Bring the water, butter and salt to a boil. Reduce heat and add flour all at once. Cook and stir the mixture with a wooden spoon until it’s smooth, pulls away from the sides of pan and leaves a noticeable film on the bottom of the pan. This will take a couple of minutes. Pour the mixture into the bowl of a stand mixer and beat with a paddle for a few minutes until there is no longer any steam rising from the dough. Beat in the eggs one at a time, beating well after each addition. The dough will go from looking lumpy to very smooth. Continue to add eggs one at a time and beat until you have the same results, scraping down the bowl after each addition. While the dough is mixing, make an egg wash combining an egg, a splash of water and a tiny pinch of salt. Set aside. Line a baking sheet with a silpat or parchment. Place the pâte à choux into a pastry bag fitted with 1/2" plain tip. Pipe 1 1/2" mounds. Wet your index finger with cold water and smooth the tops of each piece of piped dough. Brush each piece lightly with egg wash.
Bake until golden brown and puffed, about 22 to 24 minutes. Remove from the oven and cool completely. Melt the butter over medium heat and combine with the brown sugar. Lower heat a bit and cook for 2 minutes. Then add the cream and continue cooking for another 2 minutes, whisking constantly. Remove from heat and add the vanilla and rum. Add a pinch of salt, to taste. Cool. To serve, gently slice the profiteroles in half crosswise and put 3 on each plate. Place a scoop of Egg Nog Ice Cream into each profiterole and replace the tops. Drizzle lightly with the Rum Sauce and serve immediately. As far as cookies go, this is one of those thin, light, crisp cookies that always provides that really satisfying bite when the mood strikes for something little, something full of flavor and something not too sweet. These are not hit-you-over-the-head ginger cookies, which are also most certainly necessary when you want to have a bracing bolt of spice bursting in your mouth, awakening every available neuron. No, this one is delicate and soothing for those days when you just want to invite a slight tap on the shoulder. 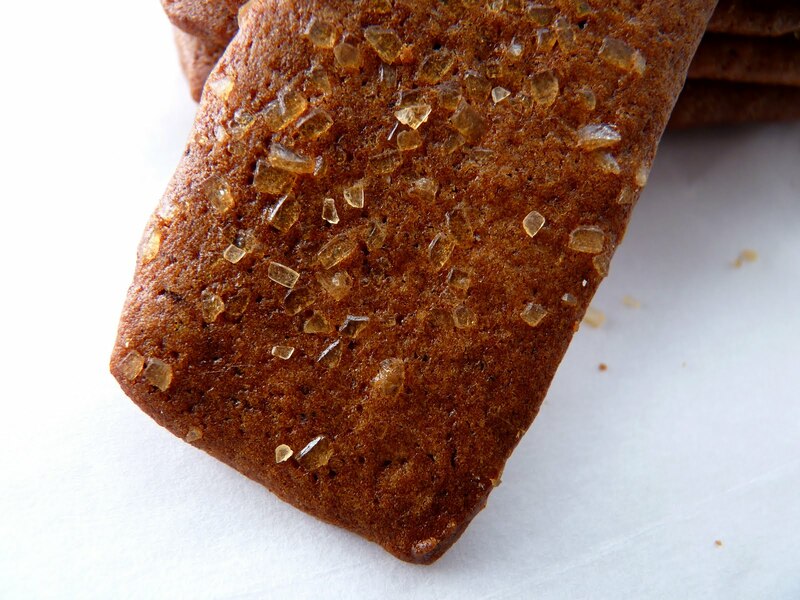 It has a nice sophisticated combination of cinnamon, ginger and black pepper. 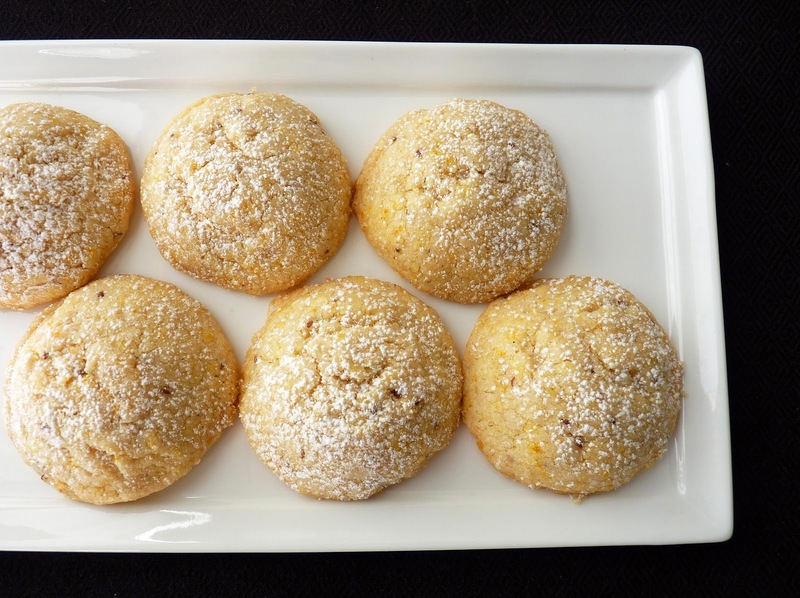 It’s a cookie that was made at Chez Panisse for years and it’s a really delicious recipe to have in your file. 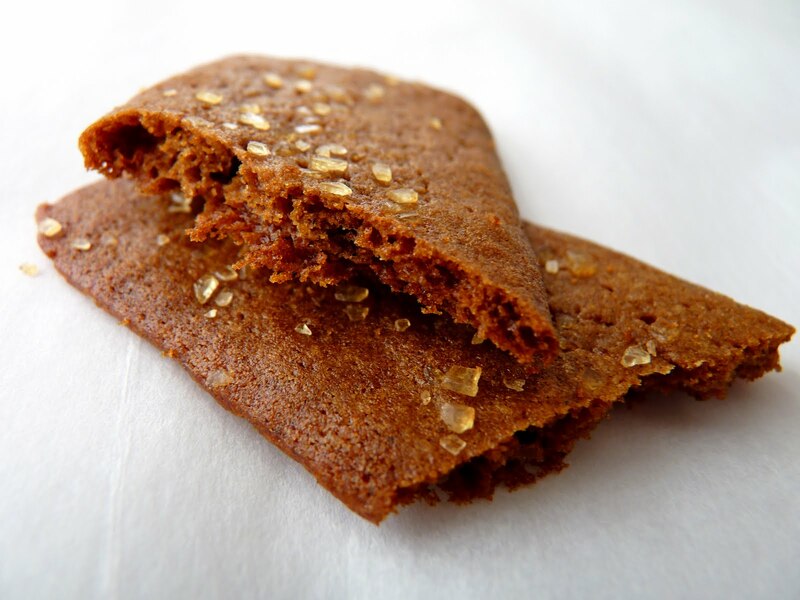 To me, it is the quintessentially modern gingersnap: spare, lean and snappy. You mix the dough, form it into a rectangle block, wrap it tightly in plastic and freeze it. You take it out and slice it into very thin wafers, top with a splotch of lovely raw sugar and bake them for just a few minutes until crisp. Really simple and really truly delicious. - This recipe makes a lot of cookies. I’ve never really kept count, so I’d probably guess about 60 or so. But the dough keeps in the freezer for quite a long time if well-wrapped and it’s hideously easy to pull it out and slice off however many cookies you’d like for the occasion. You won’t regret having them on hand. - Use a sharp thin-bladed knife to cut these into thin cookies. 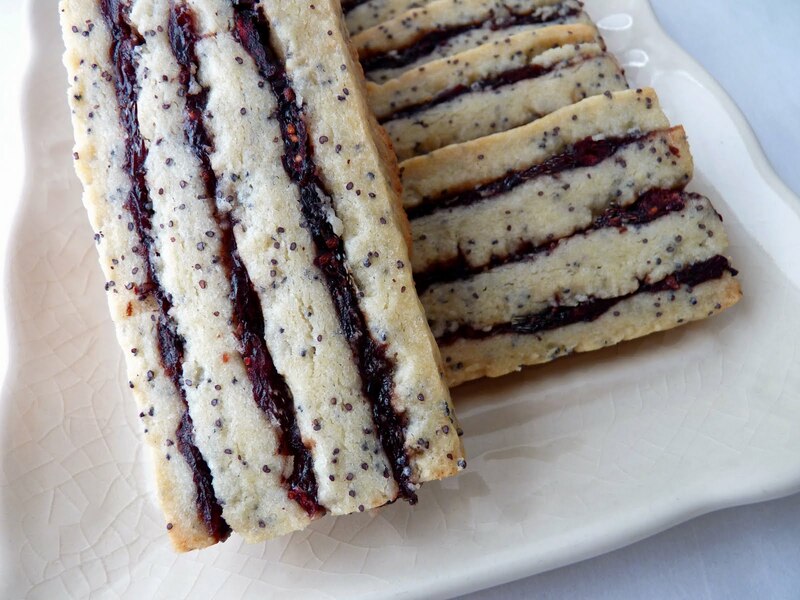 - This thin wafer style is the way they were served for years at Chez Panisse. The recipe in The Art of Simple Food instructs to divide the dough into two equal pieces using floured hands, forming into 2 logs. Then the dough is wrapped and refrigerated or frozen until firm. 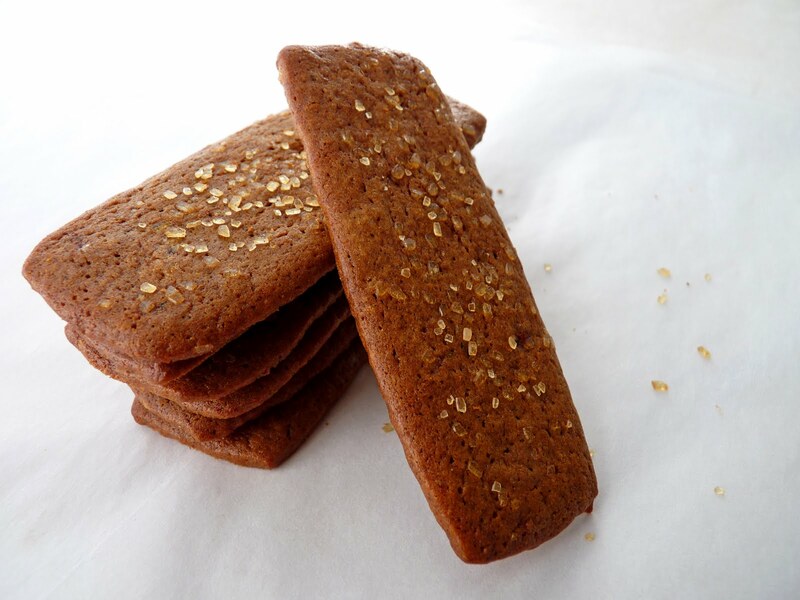 They are then sliced into 1/4” rounds, the tops dipped in sugar and baked for 10 (softer cookies) – 14 minutes (crisper cookies). Cream the butter and sugar until fluffy. Add the egg and mix thoroughly. Scrape down the bowl. Add the vanilla and molasses. Add the sifted dry ingredients and mix just until blended. Lightly dust your hands with flour and shape into a rectangle bar about 3 1/2 “ wide x 7 3/4” long x 1 1/4” tall. Freeze until firm. 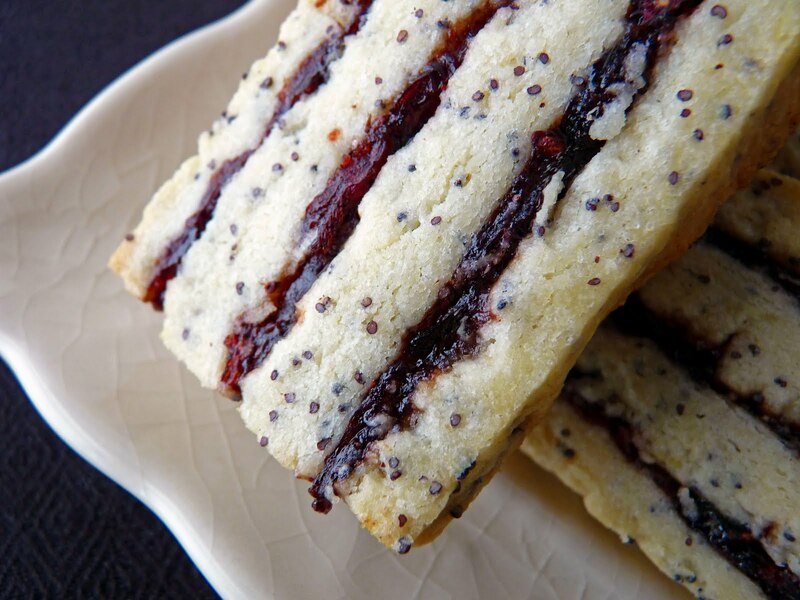 Cut the dough into slices between 1/8” – 1/4” thin and place on a baking sheet lined with a silpat or parchment. Press a few sprinkles of raw sugar into the surface of each cookie. Bake for 10 to 12 minutes. Cool and store in an airtight container.